The United States Coast Guard Rescue Swimmers profiled for Red Bull's Red Bulletin Magazine in the frigid waters off Kodiak Island, Alaska. 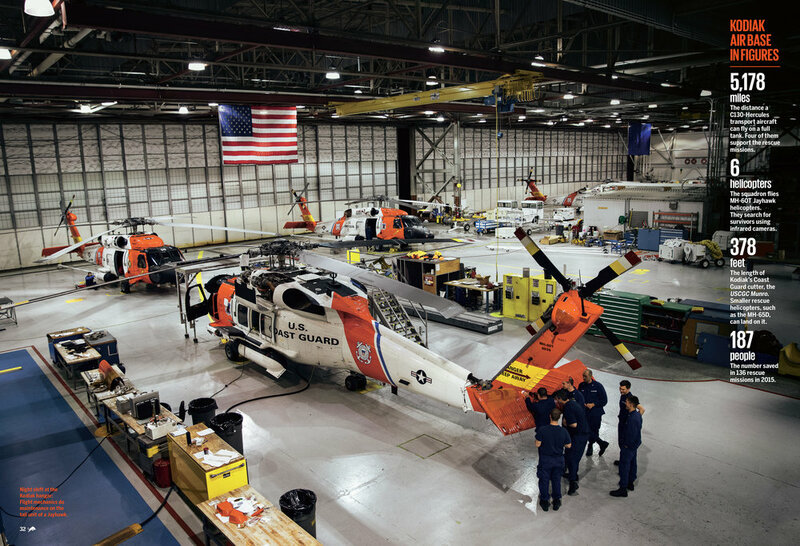 Justin spent two weeks training, flying and swimming with the Coast Guard Rescue Swimmers to document the extreme conditions they operate in to save lives and protect the Alaskan Coast. From Kodiak, rescue helicopters fly north to the Arctic Ocean, where ice floes the size of football fields can be seen floating in the water. To the west, the Coast Guard watches over the Bering Sea, where Arctic storms transform the waves into dark blue walls. Air Station Kodiak is responsible for an area of some 4 million square miles in some of the most remote terrain in US. 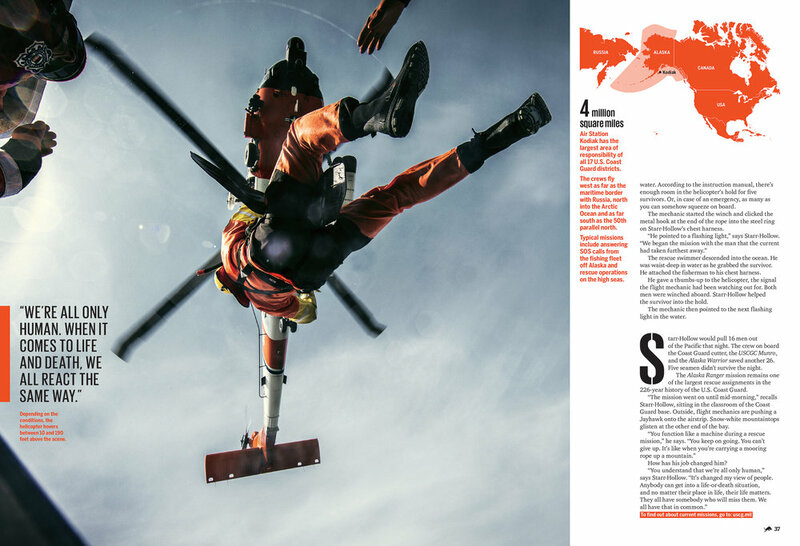 "48 Hours with the Alaska Coast Guard" feature in the Sept 2016 issue of The Red Bulletin. Behind the scenes from Justin Bastien as he photographs the United States Coast Guard Rescue Swimmers in Kodiak Alaska for Red Bull's Red Bulletin Magazine. Justin Bastien shooting high angle cliff rescue operations in Kodiak, Alaska. Justin Bastien and Aviation Maintenance Technician Jayson Marrero flying in a USCG Jayhawk helicopter over Chinak Bay, Alaska. Justin Bastien diving in with a Rescue Swimmer in the USCG training facility. Kodiak Air Station, Alaska. Justin heads in after a rough day in cold Alaskan waters photographing the Rescue Swimmers in high surf ops. The last day of the shoot photographing high surf operations with an amazing team from the USCG. Photographer: Justin Bastien, Aviation Survival Technician: Jason McGrath, Aviation Survival Technician: Jon Kreske, Aviation Survival Technician Chief Tom Bolen and Aviation Survival Technician: O’Brien Starr-Hollow. View more photographs from the project.